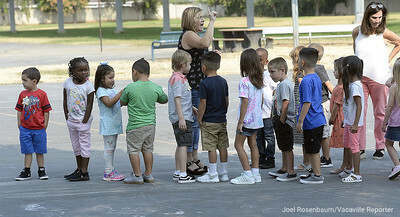 Tremont Elementary School kindergarten teacher, Mia Lodigiani welcomes her new students into the classroom Thursday on the first day of school in Dixon. Ilanna Okhomina, 5 of Dixon gives her mother, Tammy a big goodbye hug as she leaves her kindergarten classroom at Tremont Elementary School Thursday on the first day of school in Dixon. Okhomina said that unlike her three older children, Ilanna didn't go to preschool so she was both nervous and excited for her first day. 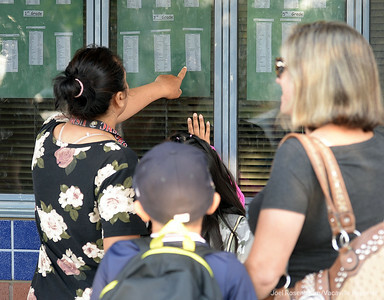 Parents and their students at Tremont Elementary School scan the classroom rosters to learn who their teachers are on the first day of school Thursday in Dixon. 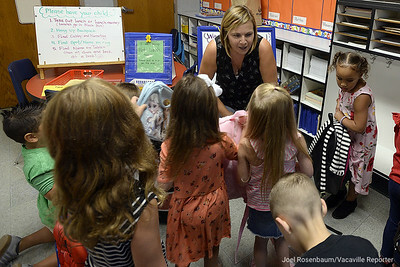 Using a stuffed animal know as "Mike the Monkey" Tremont Elementary School kindergarten teacher, Mia Lodigiani explains the class rules to her new students on the first day of school in Dixon. 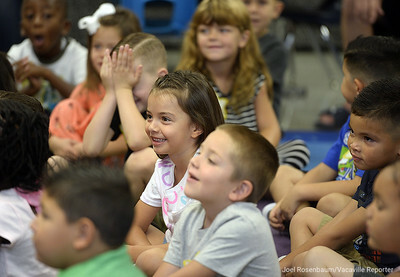 New kindergarten students at Tremont Elementary School react as their teacher, Mia Lodigiani tells them a funny story during their first day of school in Dixon. 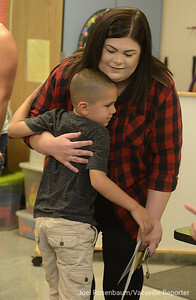 New Tremont Elementary School kindergartner, Dominic Castejon, 5 of Dixon gives his mom, Katie Radilo a big goodbye hug as she exits the classroom Thursday on the first day of school. Tremont Elementary School kindergarten teacher. Mia Lodigiani takes her new students on a tour of the campus before recess and snack timeThursday, the first day of school in Dixon. 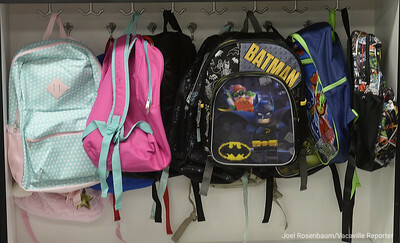 Students backpacks are neatly hung on hooks in Mia Lodigiani's kindergarten class at Tremont Elementary School in Dixon.